If you’re about to move to a new home, there is one thing you absolutely must do: Declutter before moving. Really, this is your big chance! There is no better excuse than an upcoming move to unload dead weight. Think about it: For one, moving costs money—an average of $1,170 for an in-state move or a whopping $5,630 for out-of-state—so every box you pack adds up. Plus, you want your new place to look awesome, right? Cramming nooks, crannies, and closets with junk just isn’t pretty. All of this is our long-winded way to say it’s high time you started chipping away at your possessions. For help on that front, check out these guidelines on how to declutter before moving. 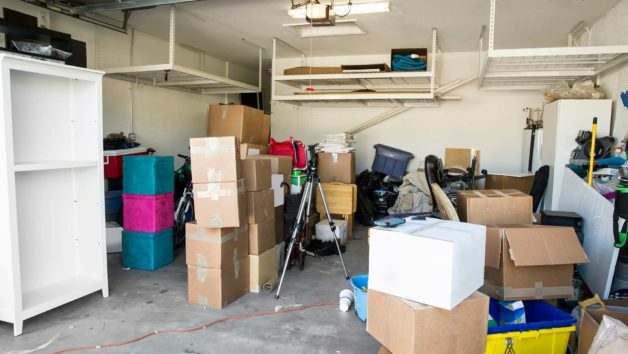 Try to start purging at least a month before you move, says Ross Sapir, CEO of Roadway Moving in New York City, which moves up to 6,000 customers each year. The reason: This gives you time to, say, sell items online or drive them to a consignment shop. Plus, advance decluttering “spreads out the (task) to make it feel like it’s less work than it actually is,” Spair says. Try to tackle one room, or one closet (or one drawer) a day—it’s less overwhelming—and never handle an item twice. Designate “toss,” “donate,” and “sell” boxes, and when you decide an item’s fate, toss it into the correct box. Done, done, and done. Gather organizational tools like packing tape, black markers, and labels in a tote; that way, you don’t have to rummage through drawers whenever the decluttering bug bites. After all, you’re going to need to get this stuff for moving day anyway, so there’s no harm in kicking things off early. Another huge help? Clear plastic bins are your friends—and great homes for small items like batteries or office supplies. You can see what’s inside, and they’re easily stackable to save space. Here are some common items you can almost certainly do without. Be merciless, and get them out of your life! Still boxed: These items never made it out of the boxes: gifts, Groupon deals that seemed like a good idea at the time, bulk purchases of all those giant jars of capers you won’t live long enough to eat. Surely, someone will appreciate these goods that fell by the wayside. You might even be able to raise some cash by selling this clutter online. But get rid of it. Not used: Tastes and waistlines change. (Especially waistlines.) If you haven’t worn or used something in a year, you probably never will again. If it’s in good shape, donate it charity. If it’s stained or hopelessly out of date, toss it. Expired: Food way past its sell-by date and expired or unwanted medication shouldn’t live with you in your new place. Some pharmacies will take back unused medication, and cleaned plastic pill bottles are recyclable. Bag up your pills and take them to your local pharmacy for safe disposal. Don’t pour or flush medicine down the drain, which can contaminate drinking water with chemicals, according to Earth911. Past paperwork: We all have boxes of documents, clippings, and recipes that we never read—they don’t need to be schlepped to a new house. If you file your tax returns online and report everything you should, the IRS says to keep returns and documentation for three years after you file. You can toss ATM and bank deposit receipts after a year. Keep “forever” documents (e.g., your birth and marriage certificates) in a separate box so you don’t mistakenly pitch them with your Dave & Busters receipts.